Warhammer: Visions is a monthly magazine that is overflowing with fantastic photographs of Citadel miniatures. From Golden Demon to Armies on Parade, every month the White Dwarf team deliver a spectacular array of images to delight and inspire you. 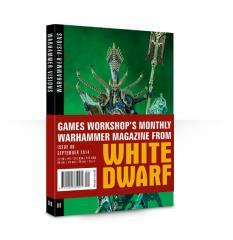 Includes sections from Army of the Month, Blanchitsu, Kit Bash and Paint Splatter - each edition is wonderfully unique and the perfect monthly companion for any hobbyist.